Here's a cracked Genesis game for a change. Thanks again to Lord Azathoth for pointing me in the right direction. Unfortunately, there seems to be some confusion regarding these copy protected pirate games on the genesis. Some newer emulators emulate these protections, but a couple of cracked ROMs already exist aswell, although it's not always obvious which versions are cracked and which aren't. Anyway, this game actually looks rather nice compared to its SNES counterparts, gone is the jerky framerate and the graphics look rather clean. Let me know if you have problems. A friend of mine asked me if I could help him install a switchless multinorm mod in his Mk1 Mega Drive and passed me these instructions by mmmonkey. Program a PIC microcontroller, solder 8 wires and be done with it, piece of cake. 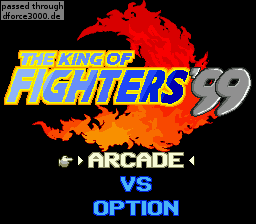 As it turned out, the PIC code (which was originally created for a Sega Saturn mod) didn't work on 80% of my 16F630 chips for no apparent reason. It wouldn't even boot on them, no matter what, even though my own programs ran perfectly fine on these chips. Next, the Mega Drive that was about to be modded turned out to be an early Mk1 unit. In contrast to all later models, these use active-high reset logic, which the author of above page tried to tackle with this behemoth of a mod that, even though it surely took a lot of effort to develop, seemed a bit excessive. Obviously, a clean solution to both problems would be to create my own mod, including a working PIC program that would run on all Mega Drive models without any additional parts. The focus here lies on simplicity. No additional independant 50/60Hz-switching, no reset on language check, no blinking LEDs. I conciously decided against these because although they sound great on paper, at least for me they constantly got in the way for all practical purposes, with accidental mode changes and resets being the norm. Please try it out and share your experience. 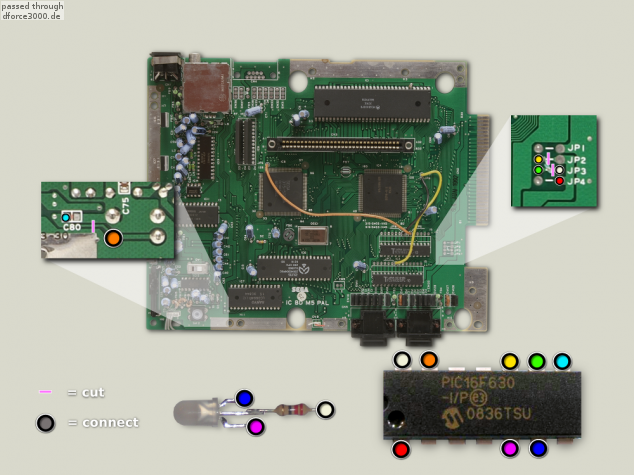 If you're modding a NTSC system or even a Genesis 3, please send some pictures along so that I can include them in the instructions, that'd be great!